GET Hiking: The next adventure . . .
For a year, Bart and I have been talking about the next adventure. We didn't always know what that next adventure would be, but somewhere along the way we got the idea of hiking the western leg of the GET. See how the GET splits in Maryland and Pennsylvania? Lured by the Standing Stone Trail President, we took the eastern route last year. 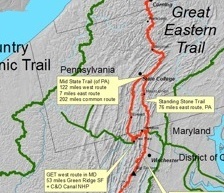 What better than to now hike the western route and then the Allegheny Trail south for a beautiful 500-mile summer? I have all the maps. Bart and I have the chunk of time carved out in our schedules. I have a modest but comfortable amount saved up for the inevitable pizza stops. I even have a train ticket. Yet the hike has been in jeopardy because of me . . . and I probably want to hike this even more than Bart does. Getting food poisoning last year made me feel like this. This seems quaint after all the stuff I've had this year. I've gotta say that 2014 has been the most challenging year of my life due to being constantly sick. I've been out sick from work for the past two weeks with ten different medications trying to find a balance in my system, and I just feel like a ghost of a human being. So, the long process of healing has begun. After 16 days of being confined to bed, I joined the world of the living. I have just a couple of weeks to regain my strength. Today, my humble goal was to actually go to work. I did it, took a five hour nap, and then went for a walk.